September 2010 -- Skandaraj Navaratnam, 40, disappears from Toronto's gay village. Dec. 29, 2010 -- Abdulbasir Faizi, 42, is reported missing to Peel Regional Police, west of Toronto. He was last seen in Toronto's gay village. October 2012 -- Majeed Kayhan, 58, of Toronto, is reported missing. November 2012 -- Police launch Project Houston to investigate the disappearances of Faizi, Navaratnam and Kayhan. April 2014 -- Police close Project Houston, saying none of their findings would classify anyone as a suspect of a criminal offence. August 2015 -- Soroush Mahmudi, 50, of Toronto, is reported missing. May 2016 - July 2017 -- Police believe Dean Lisowick, 43 or 44, of no fixed address, was killed by McArthur during this time span. April 14, 2017 -- Selim Esen, 44, is reported missing. June 26, 2017 -- Andrew Kinsman, 49, is reported missing. August 2017 -- Police launch Project Prism to investigate the disappearances of Esen and Kinsman. September 2017 -- Project Prism officers identify McArthur "as someone to be included or excluded as being involved in the disappearance of Andrew Kinsman." Dec. 8, 2017 -- Police Chief Mark Saunders says the force will review its practices in missing persons investigations. He denies that there is evidence suggesting a serial killer is walking the streets of Toronto. Jan. 17, 2018 -- Police uncover evidence suggesting McArthur was responsible for both Kinsman and Esen's deaths, along with the deaths of other unidentified people. Jan. 18, 2018 -- McArthur is arrested and charged with first-degree murder in the deaths of Esen and Kinsman. Police say McArthur is believed to be responsible for other deaths. Jan. 19, 2018 -- McArthur has his first court appearance. Jan. 29, 2018 -- McArthur is charged with first-degree murder in the deaths of Mahmudi, Kayhan and Lisowick. Police call McArthur an alleged serial killer and say more victims may be identified. Feb. 8, 2018 -- Police say they've recovered the remains of six people from planters at a house where McArthur worked as a landscaper, and say they expect more charges. Feb. 13, 2018 -- Police say excavation at the home's backyard turned up no human remains, but suggest they may "revisit the scene" when the weather warms up. 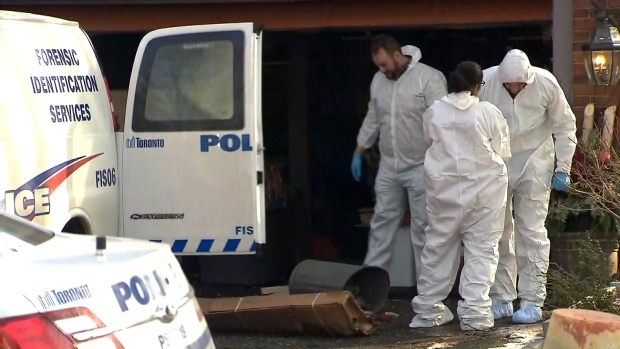 Feb. 23, 2018 -- Police lay a sixth charge of first-degree murder against McArthur, identify Navaratnam as one of the alleged victims whose remains were found in the planters. March 5, 2018 -- Police say they've recovered the remains of a seventh person linked to McArthur. April 11, 2018 -- Police lay a seventh murder charge against McArthur in Faizi's death. April 16, 2018 -- Police lay an eighth murder charge against McArthur in the death of Kirushna Kumar Kanagaratnam, who came to Canada from Sri Lanka and was not reported missing.